We love cooking over the campfire, and the Robens Bighorn is our new favourite campfire cooking must-have item. We love a good campfire. To us, it’s all part of the camping experience. But what makes the campfire extra special, is being able to cook over it. The Bighorn is a big cast iron pan that you place over the top of your campfire. 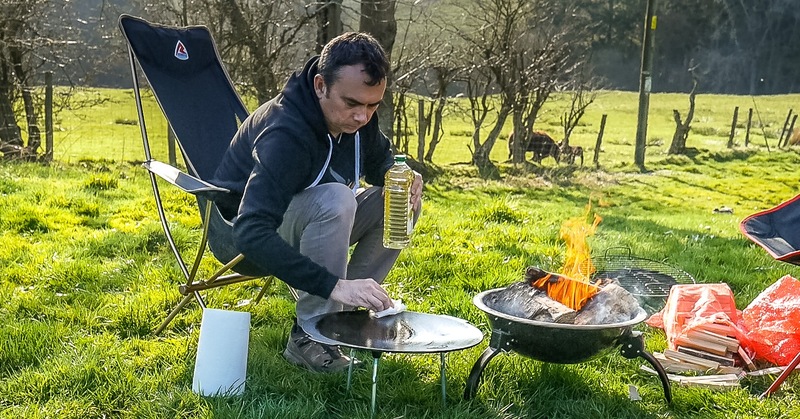 It sits on 3 legs (supplied with the pan), above the hot coals and flames of your campfire. Anything you can fry or griddle can be cooked on the Robens Bighorn. 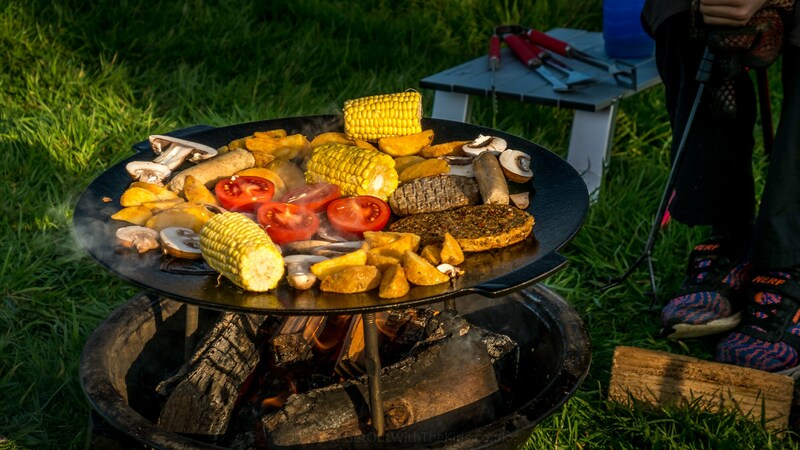 It is a large pan (44cm across), and ideally, you would place it over a campfire that’s set on the ground. But since not many campsites allow this, you’ll want to use it over a fire pit that’s big enough. 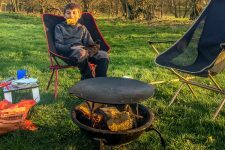 Fortunately, our Outwell Cazel firepit was the perfect size. Before you use the Robens Bighorn – “Seasoning”! No, not seasoning for your food, but seasoning for the Bighorn. “Seasoning”, in this case, is not herbs and spices, but creating a natural waterproof non-stick coating for your pan. 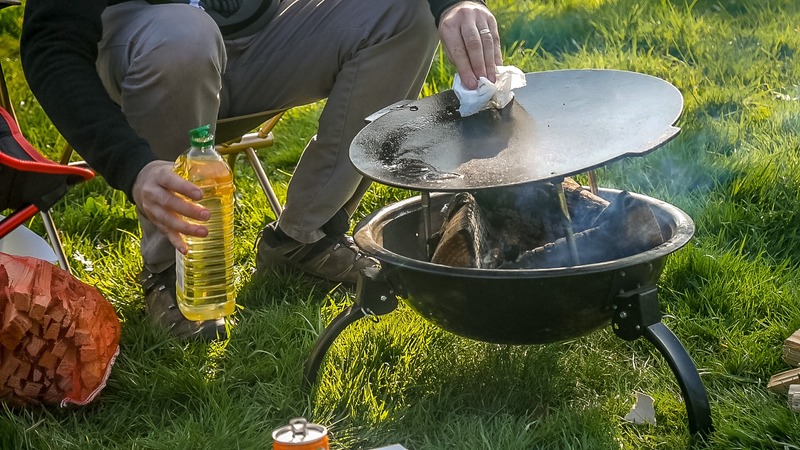 This is something you have to do on most cast-iron campfire cookware. It’s not a complicated process, and you can do it over your campfire. Just allow a bit of time before you start cooking the first time you use your Robens Bighorn. The first time you use your Robens Bighorn, give it a wash to clean off any dust from the factory. The first time you get it out to use, wash with mild soapy water. Once your Bighorn pan is dry, give it a coating of vegetable oil. Make sure you cover the top, bottom, and the sides of the pan with the oil. Apply a coat of vegetable oil on the top, bottom, and sides. Next, place the pan over the campfire, and let the oil cook in. After about 20 minutes, the oil should have baked in. You then need to apply another coat of vegetable oil. Always apply the oil to a towel or kitchen paper, and then apply to the pan. Avoid pouring cold items directly onto the pan. To handle the pan, I recommend using a pair of Hot Gloves (click here to see on Amazon). These are great items to have in your campfire cooking kit. You’ll need to repeate the process of applying vegetable oil and letting it back in several times to the cooking surface of the pan. As the fire gets hot, it will probably be less than 20 minutes between each coat of oil, and you’ll soon have baked in enough ‘seasoning’ to create a natural non-stick waterproof surface to your pan. Make sure you turn food regularly to avoid it sticking – remember the heat from the fire is hotter in some places than others. If you need to add some more oil to the pan, then do so, a little at a time. This will help avoid item’s sticking and will further build up the waterproof protection to the cast iron. We really like griddled tomatoes, but you do have to be careful that the acid from the tomato’s juice doesn’t ruin your non-stick surface, especially if they start to burn. Obviously, watch your kids with this. The cast iron pan is one big hot plate! Fortunately for us, we’ve trained our kids to be respectful of the fire from an early age. They love getting involved with campfire cooking. 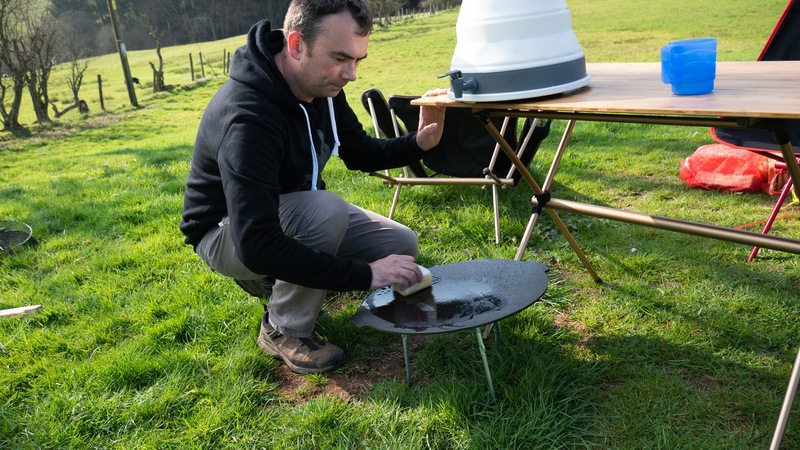 If you have built-up enough layers of seasoning beforehand, then cleaning the Robens Bighorn should be quite easy. Rubbing the surface with some kitchen paper towels should get a lot of the food off it, especially if you leave it to cook over the fire a bit longer, which can help break down stubborn bits of food to ash. To finish off, apply some vegetable oil to a kitchen paper towel, rub that over the pan, and let that bake in. This will both help clean it, but also re-season it ready for next time. Let the new coat of oil cook-in before removing the pan from the fire. Then let the pan cool down naturally. Never take the hot pan and wash it with soapy water. The hot pan could crack when cold water is added to it. Even when cold, too much soapy water could remove the seasoning from your pan and cause it to rust. After cleaning off the food, reapply another coat of oil to top up the seasoning. 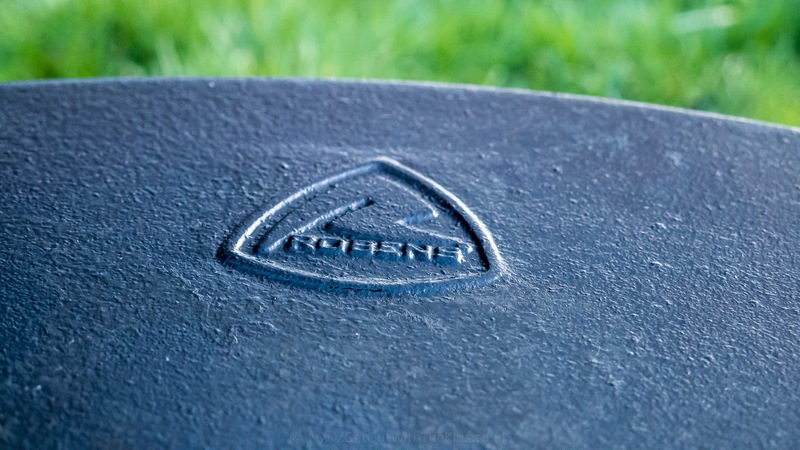 Disclaimer & Thanks: A big thank you to Robens for sending us this Bighorn 3-legged pan that we requested to review. All opinions are our own. A great option for family campfire cooking. 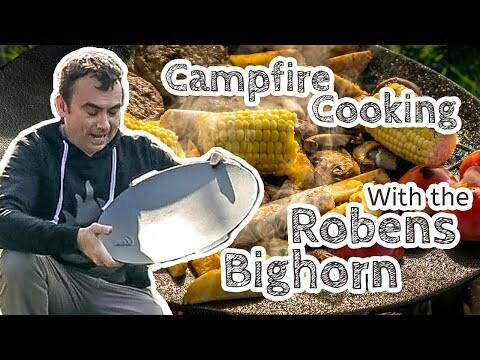 You won't need to be a campfire guru to enjoy a great cookout with the Robens Bighorn. A big pan for cooking over the campfire. A great size for families. You'll need space to transport it, but the legs screw in and out, so it doesn't take up too much space.